There’s nothing not to love about “Hollywood Obscura” by Brian Clune. The subtitle says it all, “Death, Murder, and the Paranormal Aftermath,” and Clune does deliver. Familiar and more obscure Hollywood deaths abound, each of them worthy of a book all their own (and many of them do already have books all their own!). However Clune does a great job of summarizing each death’s backstory, popular theories, and media coverage. Classic names like Benjamin “Bugsy” Seigel and George Reeves share book space with Thelma Todd and the Los-Feliz Murder Mansion. There may not be a lot new to discover if you’re a fan of the genre, but for someone new to the Hollywood death scene, it’s a great introduction. “Hollywood Obscura” may be of interest to those interested in the paranormal. Each story ends with the “Paranormal Association.” Just take note that these play out as folklore and rarely feature paranormal investigation. Think more along the line of “and some say his ghost still walks the halls to this very day.” Personally, I have no problem with paranormal legends and folklore, but since I know I have some readers who are heavy into the scientific side of exploring the paranormal, I thought I should mention it. 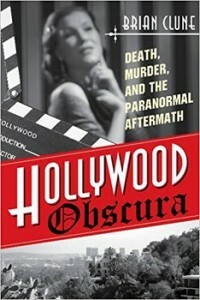 Loaded with tawdry Hollywood gossip, murder investigations, and hauntings, make “Hollywood Obscura” by Brian Clune a fun read. Learn more about “Hollywood Obscura” here.